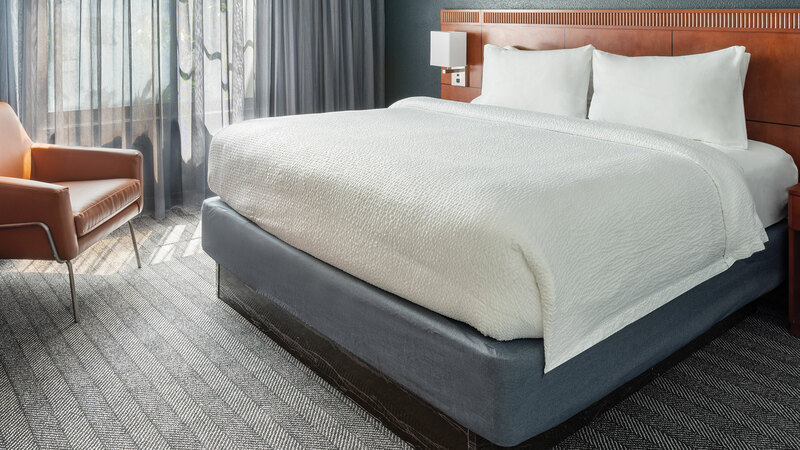 Our stylish, soft textured coverlet and shams are perfectly designed to help you relax and recharge. The Courtyard pillows provide you with plush comfort you need for a restful night’s sleep. Experience the stylish Courtyard textured coverlet and shams paired with our cotton linens for a unique look and feel to enjoy year round. Bring the coziness of the Courtyard blanket home for added warmth as a seamless addition to your bedroom. Add a little extra loft and protection to your bed with our mattress topper you have come to love from your Courtyard stays. Bring the Courtyard sleep experience home with you with our mattress and box springs. Our exclusive Shop Courtyard home collection is designed to help you unwind and reset. Although trends may come and go, the quality and comfort of our Courtyard hotel bed and bedding will stand the test of time. Bring home the exclusive Courtyard bed, textured coverlet and shams, pillows, comforters, bathrobes, towels, Bistro serveware and more.